The McCloud River is a frequented hot spot in the month of October and into the first two weeks of November for many anglers. 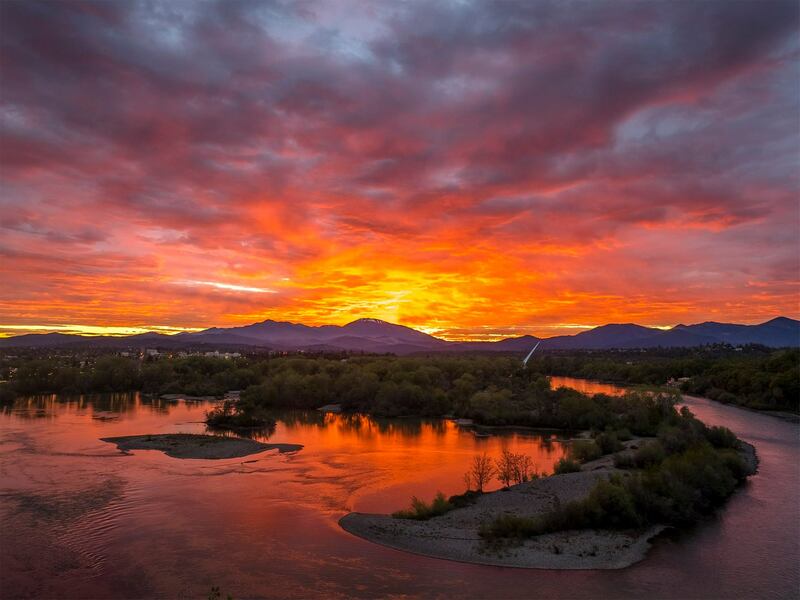 The river is home to the world’s most famous rainbow trout and the watershed is a magical destination particularly when decked with brilliant fall plumage. Whether it be camping at Ah-Di-Nah campground and fishing the Nature Conservancy or staying at one the private stretches like the Bollibokka Club we know there are many folks out there with plans for a visit before the end of trout season. For those planning a visit please take a look at the notice below before making the trek. Predicting weather is always tough, so at this point it’s only an advisory. 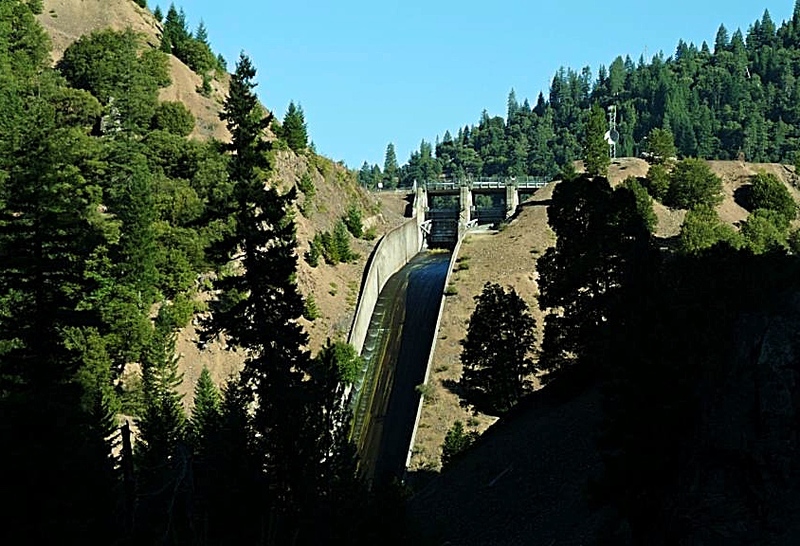 McCloud Reservoir Spill Expected this weekend as weather systems pound Northern California. “This is an advisory notification only. Based on the upcoming storms and the James B. 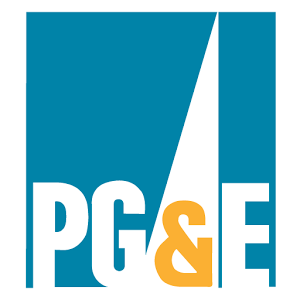 Black Power House Unit 1 outage, PG&E may be spilling McCloud Reservoir over the weekend. With the amount of rain forecasted, the unusually high flows on the McCloud River are expected to last through the end of next week”. Still one of our favorite photos of McCloud Reservoir with fly fishing guide Greg Dean making the cast from his red jet boat. His wife Kimmer captured this awesome shot. 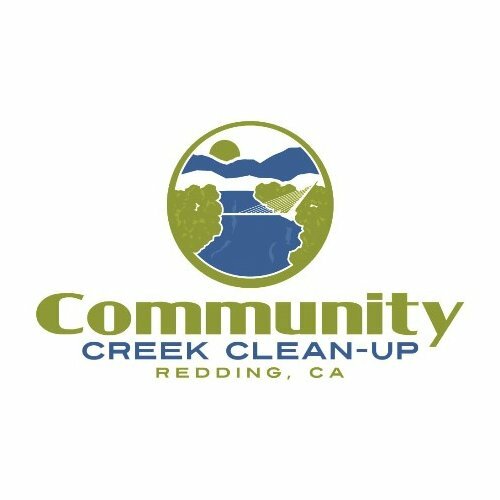 Come join our local community on Saturday, October 1, 2016, from 8:00 AM – Noon, as we tackle the litter and invasive vegetation that has become overgrown and reduces visibility of the Sacramento River. Creek Cleanup 2016 will focus on the north side of the Sacramento River Trail, between the Market Street Bridge and the Arboretum Trailhead. During these four short hours, hundreds of volunteers will gather to help remove trash and invasive vegetation, opening up the view of the River along this section of the Sacramento River Trail. 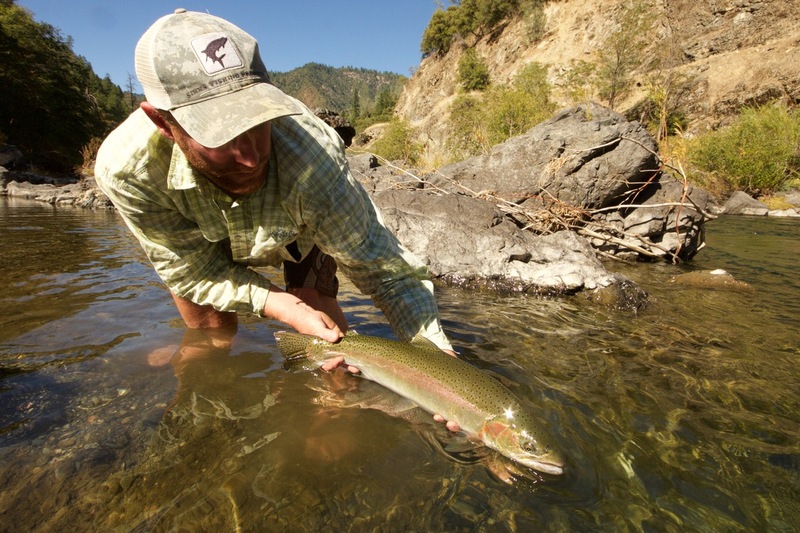 This year, the Shasta Trinity Fly Fishers will lead a river-based clean-up effort. Volunteers with jet boats will be on the water retrieving debris from areas not accessible by land. Bring your water bottle, wear closed toe shoes, long pants, plenty of sunscreen, and come out and help restore the riparian savannah along the Sacramento River Trail. You can make a substantial contribution in the heart of Redding during a single morning of labor involving hundreds of your fellow citizens. Event organizers will have gloves, safety goggles, buckets, and garden tools available for use. Please bring your own if you have them. Registration/Check In – 1500 Quartz Hill Rd. Refreshments sponsored by Shasta Association of REALTORS and Dutch Bros. Fly Fishing Film Tour Comes to Redding! Come down to the Redding Civic Auditorium this November 3rd 2016 at 7PM! Get your tickets, bring some friends and kick back with a beer and enjoy the show. 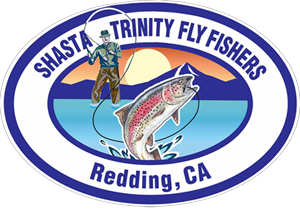 F3T is nearly a decade deep and this event helps support our local Trout Unlimited Shasta Trinity Cascade Chapter. Come out and show your support! The original and preeminent exhibition of fly fishing cinema, The F3T is a one of a kind experience. Each year, fishy folk of all ages gather at premieres to soak up films from around the world, spin a few yarns amongst friends, and dream about casts still unmade. Since its inception in 2007 The F3T has grown more than 30% each year; reaching nearly 50,000 anglers across North America last season. 2016 marks the F3T’s 10th lap around North America and this year’s lineup of films is without question the best the Tour has ever presented! With backdrops ranging from Bolivia to Saskatchewan, Montana to Virginia, Patagonia to the Seychelles, these films feature fresh, dynamic stories amongst some of the best fishing footage that has ever been shot. 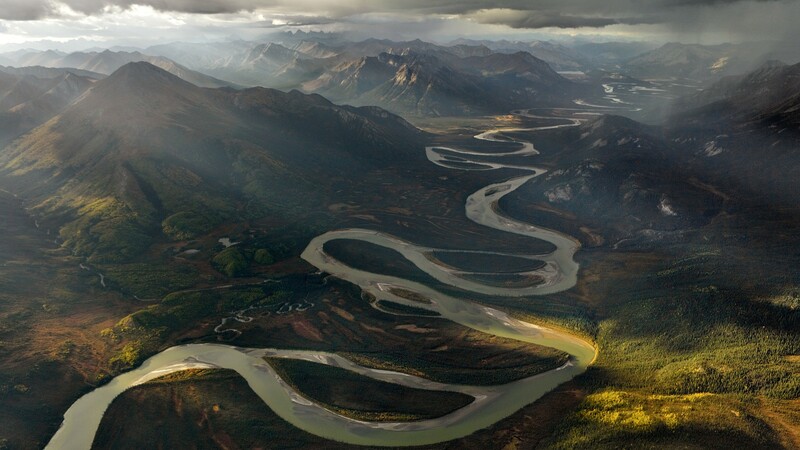 From the hunt for the world’s largest brook trout to the pursuit of billfish on the fly, gargantuan pike, acrobatic golden dorado, ferocious GTs and herculean BC steelhead, these films showcase remarkable places, larger than life characters, and fish that will haunt your dreams. 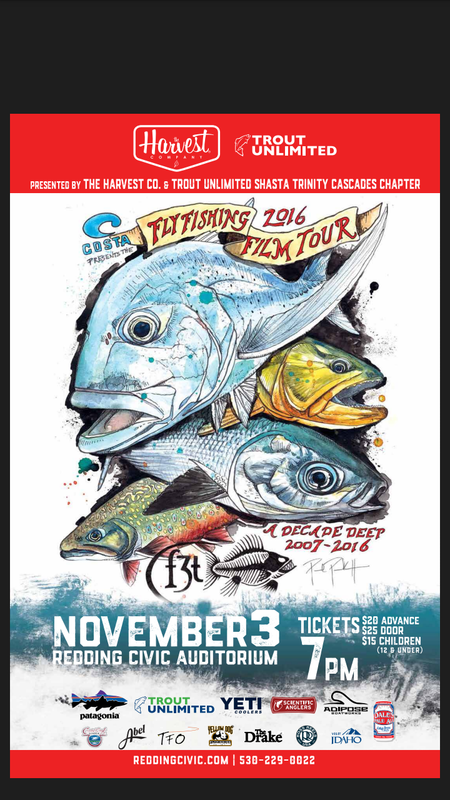 This year’s film festival is brought to you by Trout Unlimited Shasta Trinity Cascades Chapter. 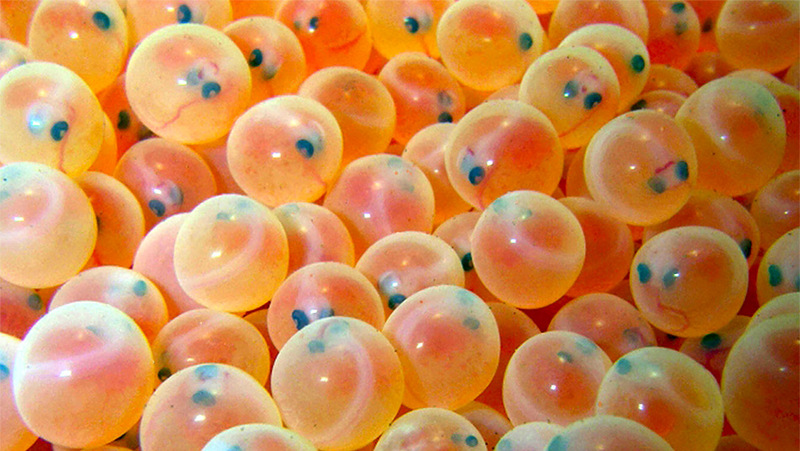 This newly formed chapter joins over 750 chapters nationwide to protect vital fishing habitat. Come to find out more about plans for the new chapter and how to become involved in our incredible local resources. Every so often in the fly fishing game you come across a particular fish or run that will haunt you. The haunting often comes because the fish can’t be caught or because maybe you’ve managed to trick the fish into eating your fly only to have it break you off or throw the hook. Either way, the proverbial fish that got away keeps you coming back if it doesn’t drive you crazy first. One of our good friends Chuck has a particular run he likes to fish at a particular time. There is one fish that has eluded Chuck many times so he comes to visit his fish for about a week straight and studies him as he begins to slurp down caddis in the surface film when the the sun leaves the water. It’s a love affair that has grown over the years and as Chuck has become a proficient angler, the fish in this run to say the least have become very savvy to any angler attempting to even get close. 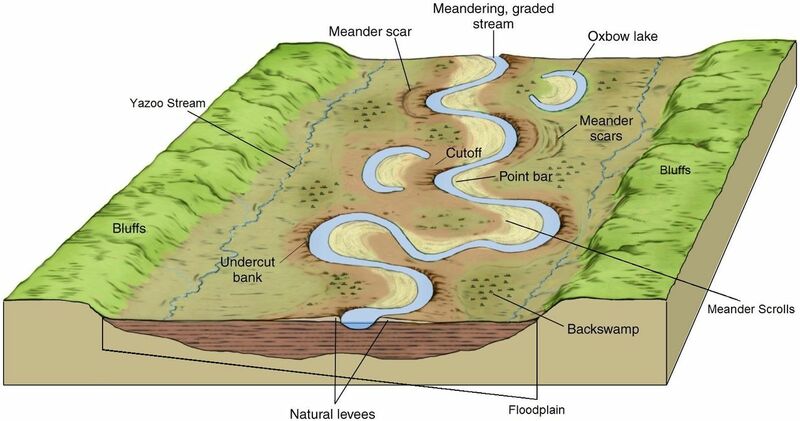 The fish that resides on the far bank is not the biggest in the river but because of the location in the current it is a very difficult spot to get a good dead drift. 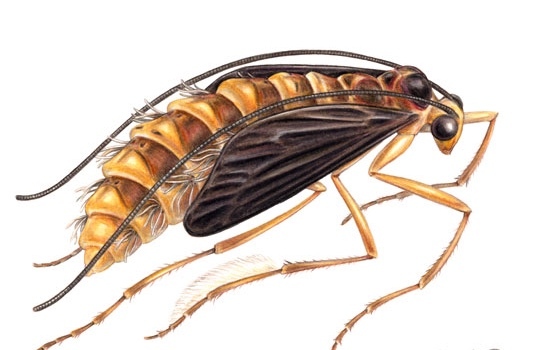 With a dry fly it requires getting the fly at least 10 to 15 feet upstream with a series of perfect mends and line feeds while also allowing the fly to drift well past the target before being picked up. One bad cast or missed mend and the fish usually go down and its worthwhile to pick and move to another location . Typically, like pictured below after a good presentation one of the unseen rainbow minions grab the offering which offer a consolation prize but also spooks the run and put the wiser fish down. Meet Chuck, and the fish he wasn’t going for although Chuck is delighted with anything pulling on the other end of the line. Chuck enjoys the pursuit and everybody involved loves the Chucky factor. One evening Chuck was making crisp casts and presenting the fly cleanly to the far bank with impeccable precision. As Chuck took his time watching the rhythm of the rises we took some video knowing it was finally going to happen. Chuck took 3 or 4 minions from the edges and patiently waited for the nose he was hunting to show back up while letting the run rest and watching the insects drift down the far seam. After numerous attempts we started running out of storage on the memory card and it appeared that Chuck was going to have to come back tomorrow and try his hand at another river poker game. With the camera off of course Chuck’s next cast just like the one before that and the one before hit the target and drifted flawlessly into the impossible seam. Boom! Fish on! Watch what happens next…. We bush wacked our way downstream into the flat where we could see heads softly nudging and sipping the PMD spinners under the elephant ear. And of course, the fish consistently rising were on the far bank. It was easily a 50 foot cast, which was at the extreme end of my clients powerhouse. 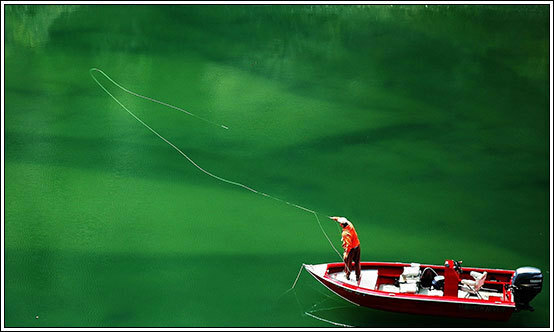 The problem would be in achieving the perfect drift in the flat velvety water even if the fly hit it’s target. Immediately my client wanted to deliver a cast. I told him to wait and lets just see what else we are missing. I knew if we made a cast to the fish on the far bank we would most likely spook the entire flat and particularly the fish that might be in between. As we sat there, the fish on the far bank continued in synchronicity, gently sipping and following into rhythm while throughly taunting us. My client was like a quivering labrador retriever and those fish were the tennis ball that was just thrown across the river, he couldn’t focus on anything but the prize on the very far side. I couldn’t blame him, they were getting to me too. I could feel his impatient desire to get it done and at the same point also slowly starting to loath his guide. I wanted those fish on the far side but I wanted to pick several opportunities and turn this flat from a one fish run into a multiple fish run. Several minutes into the silent recon a subtle head showed in the shallows behind a small rock on our side, a small lie that looked too shallow to provide enough protection to hold fish. Thirty more seconds and another rise on our side but from another fish. The fish on our side had slow rhythm and only broke the surface every 3 to 5 minutes but they were there and they were moving around. If we would of waded out for the fish on the far side we would have never seen them. We lengthened our leader by putting on some fresh Rio Tippet, pulled out some extra fly line and devised our plan of attack on the fish closest to us. It would be a one cast shot, high sticked and then the rod dropped followed by an all out feed maximizing our stealthy drift without notifying other fish we hadn’t seen. His first cast fell short and I hastily blurted, leave it! He followed through with our plan even though it didn’t reach its destination and bam! A nice fish slapped his dry fly, fish on. I let out a silent sigh of relief. We kept the rod tip downstream and towards the bank and angled the fish towards us and away from the others. 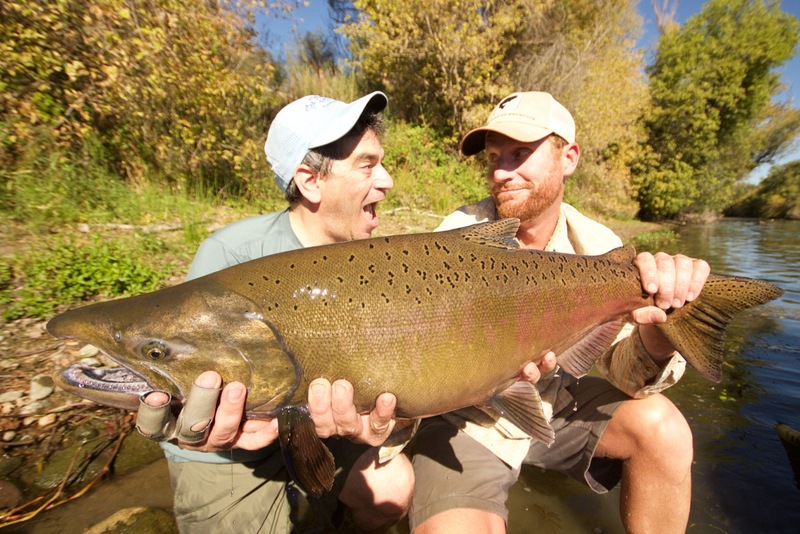 We admired the moment and the freckled rainbow with a small dry fly hanging from the upper mandible. We continued this game and started playing “battleship.” A-1, A-2, A-3 and so on. We were able to get 6 different fish to take our fly with a few refusals. Eventually 30 minutes or more later we were at the fish on the far side. He made one of the best casts of the day and hit the target. But in attempting to make the mend to the far side in order to get the perfect drift he spooked the wily fish. It was an almost impossible shot. We let them rest and changed our attack but they never took our fly that day. Fish your feet, be patient and work slowly into a run. And most important enjoy the hunt and everything it encompasses. Notice the small burble on the surface of water just below the anglers line? This was just enough to hold a few fish before we attacked the small seam under the elephant ear on the far side. There are times where you might find yourself with a definitive goal in mind. Or perhaps, focused on a specific prize or result. Often while in the pursuit we come across something that wasn’t in the scope of our intended target, whether in life or on the river. Some may scoff and others may rejoice. In this particular instance depicted in the photo we had already experienced an epic day chasing trout and the occasional steelhead while enjoying the bounties of Northern California in the springtime. Yes, we target trout and steelhead. 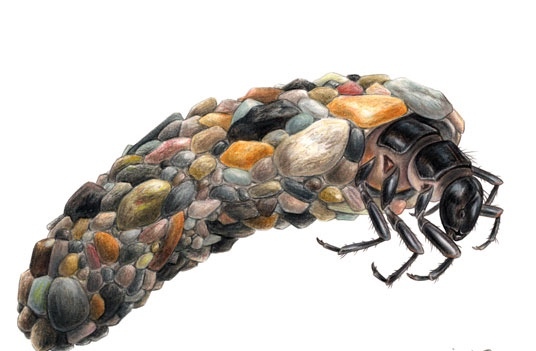 But don’t forget about the other species that inhabit our waterways. And remember, when you focus on a specific prize, don’t ignore all the other wonderful discoveries that may go unnoticed. In life, or on the river. A sweet specimen tackled by Lowell on the Lower Sacramento River on 6 weight and light tippet.